PUTRAJAYA, 10 Jul 2014 – The National University of Malaysia (UKM) and Universiti Sains Malaysia (USM) will carry out research for the conservation, preservation and protection of flora and fauna at Pulau Orang Utan and Pulau Banding in Belum Forest, Perak. Two Memoranda of Understanding (MoU) were signed here today between UKM/USM and Bukit Merah Orang Utan Island Foundation and Pulau Banding Foundation at the Education Ministry. 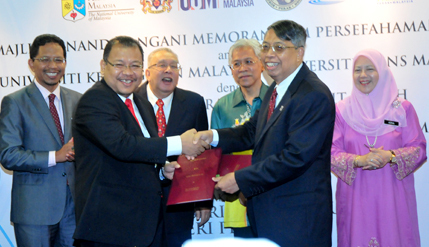 The signing was witnessed by Education Minister II Dato’ Seri Idris Jusoh. Vice-Chancellors Professor Datuk Dr Noor Azlan Ghazali and Prof Dato’ Dr Omar Osman signed for UKM and USM respectively, while Bukit Merah Orang Utan Island Foundation Trustees Board chairman and Pulau Banding Foundation advisor Tan Sri Mustapha Kamal Abu Bakar signed for both entities. Idris said the Orang Utan Island and the Belum Forest were huge national assets not only to ensure balanced development but also for the use of research institutions. The MoUs will enable the universities to undertake research and education in the areas. “When people talk of the Orang Utan species, they can refer to USM. When they talk of the Belum Forest flora and fauna, they can refer to UKM,” he said. Prof Noor Azlan said UKM has the necessary expertise to devise ways of protecting the biodiversity of animals and plants in the Belum Forest. The UKM, he said, has been carrying out research at the Langkawi GeoPark and the Marine Park at Mersing with distinction. USM Professor of Biological Sciences Dr Mashhor Mansor said the research aimed at raising the status of the Orang Utan to that of the Panda because the Orang Utan was native to only Malaysia and Indonesia. “They are very iconic species but we do not have the room to conduct in-depth studies such as in the case of the Panda. Anything that we publish on the Orang Utan will reach the international level,” Mashhor said. The Bukit Merah Orang Utan Island is the world’s only ex situ (off-site) conservation centre for the Orang Utan, where an almost natural habitat has been created to prevent their extinction. The centre had leased nine Orang Utans from the Sarawak government and three more from the Melaka Zoo and the animals have now multiplied to 24. Tan Sri Mustapha Kamal, who is passionate about reviving the population of orang utans, revealed that the government had pledged RM5 million to the project at Orang Utan island. The Pulau Banding Foundation, established in 2007, aims to promote, undertake as well as undertake research and studies on tropical rainforests. It developed from a vision of maintaining the sustainability of the Belum-Temengor Rainforest complex landscape, environment and communities.